Bruce Mitchell Drives In as the new Captain of The Royal and Ancient Golf Club of St Andrews. Credit The R&A. 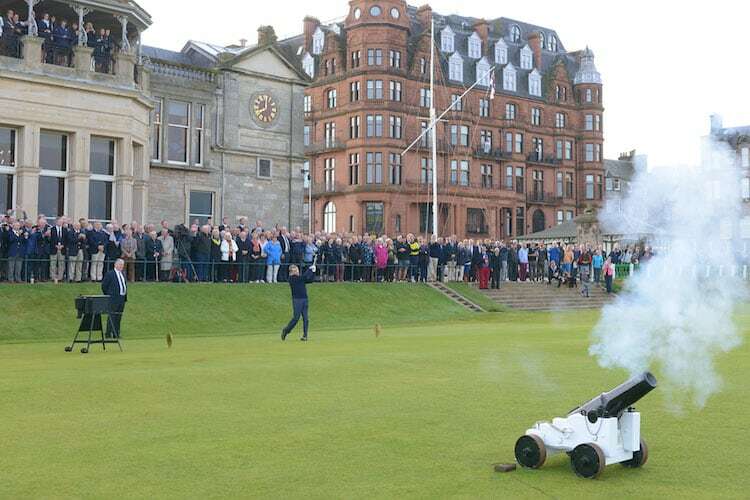 The traditional driving-in ceremony for the new Captain of The Royal and Ancient Golf Club of St Andrews took place on the 1st tee of the Old Course today. Bruce Mitchell started his year in office with a drive at precisely 8am as a cannon fired alongside the tee. A large crowd including Past Captains of the Club gathered to watch the ceremony. As well as being Captain of The Royal and Ancient Golf Club of St Andrews, Mr Mitchell will also serve in an ambassadorial role for The R&A to support its work in developing golf around the world. He will attend R&A championships in the professional and amateur game. He is the first Canadian to be made Captain. A member of The Toronto Golf Club where he served as President in 1996 and 1997, Mr Mitchell is a past club champion of Windermere Golf and Country Club where he was a Trustee and then Co-Chair in 2007 and 2008. He became a member of The Royal and Ancient Golf Club of St Andrews in 1988 and in 2001 won both The Queen Victoria Jubilee Vase and The Royal Sydney Plate (match play knockout competitions played during the Club’s Autumn Meeting). He currently plays to a handicap of 14. In the past, the Club Captaincy was bestowed on the winner of the annual Challenge for the Silver Club but by the early 19th Century the Captaincy had become an elected office. Part of the tradition is that the new Captain buys his golf ball back from the caddie who retrieves and returns it. Mr Mitchell elected to buy his golf ball back with a Canadian Gold Maple Leaf coin.